Hi everyone. 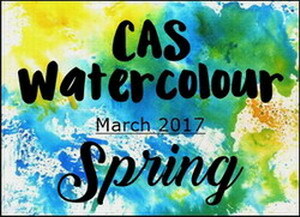 Today's card is a reminder about the CAS Watercolour March Challenge - Spring. There's just over a week left to play along. 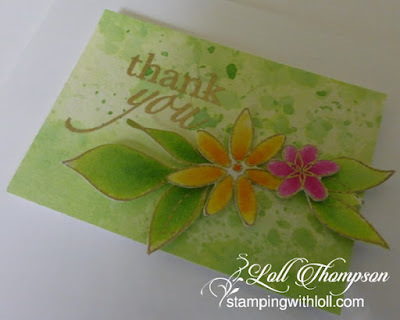 I started with a Splash Watercolour background (click HERE for video tutorial), using twisted citron and mowed lawn distress inks. The colours definitely say Spring to me. I used a couple of small flower and leaf stamps, heat embossed in gold and watercoloured with more distress inks. I added a small gold embossed sentiment to finish. I hope you'll come join us for this fun challenge. Use any products that give a watercoloured look (distress inks, dye inks, acrylic paints, inka gold, gelatos, distress crayons, etc.). Check out all the reminder cards from the rest of our Design Team and our wonderful Guest Designer, Heather by clicking HERE. Gorgeous smooshed background for your pretty flower and leaves. I love your gold accents, Loll. Your photo looks beautiful to me, but I know what you mean when you can't get it perfect. TFS my friend. Hugs..
What a pretty splash background! These greens certainly do look like spring! Love the little flowers and the gold embossing too! Oh What a beauty Loll - love your colours!! Oh, how beautiful, Loll and it's definitely singing spring!!!!!! I love the soft dreamy look of the sweet little flowers and leaves against your lovely green bg!!!! Your watercolouring of the flowers is really great and I'm definitely going to have a look at the video for the bg technique!!!! What I admire mostly about your work, Loll is how you work with the same basic lo very often and sometimes use the same leaves or flower dies or stamps on cards, but you always come up with a fresh new look and each card is so unique!!!!! And you're for sure the Queen of techniques to create stunning bgs!!!! This is another beauty, my friend!!!! Off to watch the video!!!! Your flowers look lovely against that gorgeous background Loll! Such a lovely fresh Spring green with little flowers that have the promise of Summer, love it. The soft colors on this are just exquisite! Love that background once again, Loll and the gold embossed, painted floral stamp is so well done! Love it. Agree too, lighting and photos is not an easy task with some colors! This pretty, green spring card is a feast for my eyes after snowstorm Stella dumped 30 inches of white stuff around here...! Thank you! Now your background is one gorgeous watercolor Loll! Your embossing and watercoloring are spectacular. Gasp! Spring on a card ~ Thank You!!! Your artistic design is not lost on us, even if your camera didn't want to cooperate! I love the mix of greens and your gold embossing is super elegant! Really gorgeous card, Loll!